Polaris GENERAL has issued orders to attack and is throwing a massive arsenal behind the bold plan. A call to arms has been issued to Hunters, Adventurers and Farmers and the GENERAL has what it takes. Of course we are talking about the new 100HP Polaris GENERAL Side x Side vehicle, a true 5-Star off-road utility vehicle blending the hard working attributes of their market dominating Ranger vehicles and the championship winning Polaris RZR sports series. The growing recreational hunting and outdoor market for side x sides has seen serious users seeking out this exact vehicle and Polaris has delivered in spades. Hunters need a vehicle that can get over rugged ground at a reasonable clip and in comfort. The work side of the Rangers has been carried over to the GENERAL with a 272kg rated dump box and a towing rating of 680kg via a standard 2” receiver, plus the effortless ease of electric power steering. Engine braking System (EBS) and All-Wheel Drive (AWD) provide seamless operation to provide optimal traction and control for the given terrain. The sporting pedigree of the RZR is blended with the practicality of the Ranger by increasing suspension travel to 311mm front and 335mm at the rear for the GENERAL (254mm on Ranger) and sitting high on Independent Double Wishbones at each corner to provide a superb 305mm ground clearance plus Anti-sway Bars at the front and rear. This is all designed to allow faster travel in greater comfort over more challenging terrain and is further supported with full body underside skidplate. All versions of the GENERAL enjoy the convenience and protection from passing scrub afforded by half doors as standard. Two versions of the GENERAL are destined for New Zealand shores by late-April, the PREMIUM at an RRP of $26,495 inc GST and the DELUXE at $29,995 inc GST. Both versions include a 4500LB Winch as standard, Sport Low Profile Front Bumper plus 14” Alloy Wheels with tough 8-ply Dirt Commander Tyres. The DELUXE takes it up a level in the performance stakes with the addition of Fox Performance Series Podium shocks front and rear, plus the comfort of a Sport Roof, the convenience of a Convex Mirror and the audio bling of the GENERAL MTX Premium Soundbar with Bluetooth connection. A full range of accessories is available to further customise the GENERAL including a choice of full and partial cabins, additional lighting, a heater and gun scabbards. There is over 30 GENERAL specific accessories in the range plus another 90 common fit items to make it the ultimate hunting or farming all-rounder in all-weather comfort. 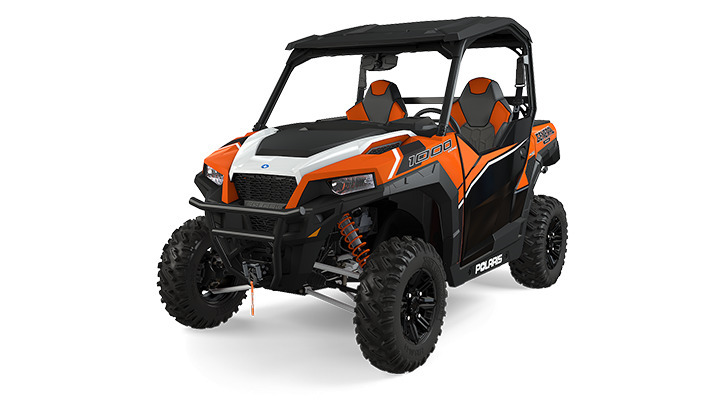 To join the hunt with the all-new Polaris GENERAL, see the specs here under Polaris GENERAL or just give us a call.